Three to a pack! Wide mouth! Holds a lot! Can be used by men, women and children! 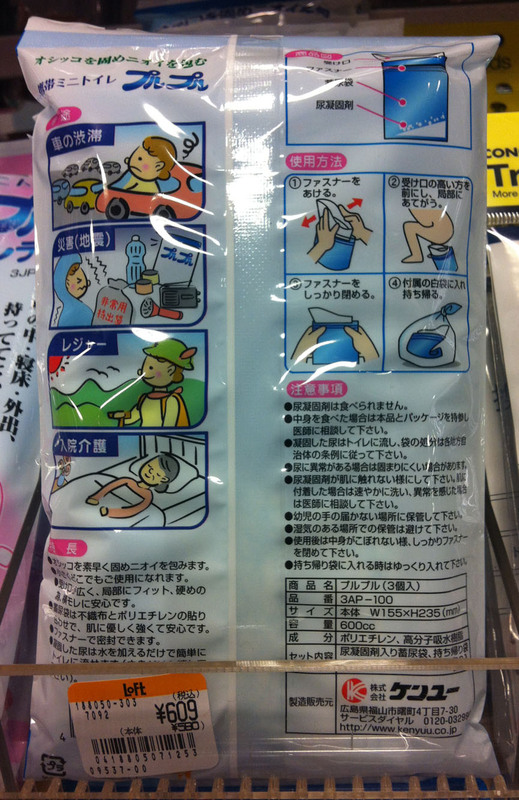 For the Japanese travel fear that dare not speak its name, behold the PuruPuru Mini Toilet bag! A quick flip to the back side convinces the already-anxious traveler (especially the one headed to barbaric foreign lands) that this product might not just be desirable, but urgently needed. Not only does it answer when nature calls, it zips up afterwards like an industrial-strength baggie. Better buy a dozen, one in every color! Traffic jam from hell? Down to your last two cans of tuna during a multi-day disaster? Trekking the uncharted and latrine-less wilderness of Sound Of Music-ish hat-wearing lands? PuruPuru to the rescue! Come on! Finding a decent public toilet in the U.S. isn’t for the faint of heart. I love the whole odd idea. You do have a point. 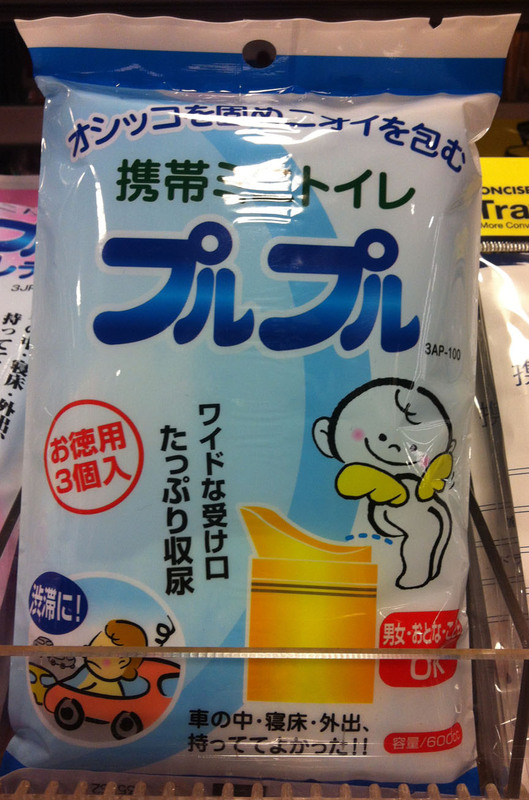 I’ve seen some of the barbaric public toilets in the foreign land of America, and I’d much rather use the PortaPee! But where would you go to, um, assume the position and deploy the product? A public restroom cubicle would seem to be just the ticket. Yes, I think that a handy bush or rock is pretty much a prerequisite for using this item, unless one is in fact near an otherwise unsuitable public facility!